Let's do it again and bring in the new year with some new connections! Another Meet n Greet to help Renters and Owners make a connection for "Happy Renting". Bring questions, properties, business cards, etc. Jen Zeller & Lindsay Burleson are providing Renter's with a Free class to gain FREE LEGAL ADVICE with your Renting questions. If you're renting and want to know what you're rights are, we highly recommend coming for some snacks and a very informative class. Please click on the Link and let us know if you can make it! Hope to see you there. 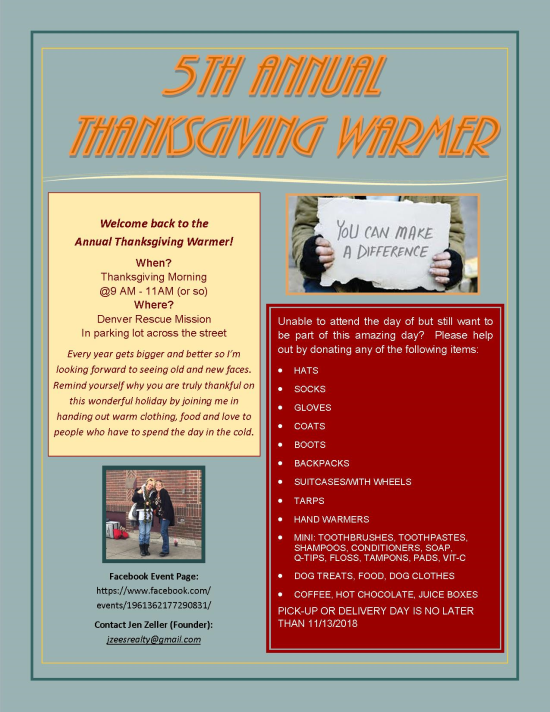 If you have items to donate, please drop off at the Farmers Insurance at 1100 S Shoshone Street, Denver. If you missed the 1st one...we believe in 2nd chances! Jordan Dalby & Jen Zeller will be providing you an hour filled with everything you need to know about buying your 1st home. From the Lending Letter to the Closing Table, you will be well informed so you won't have any surprises during the process. Lunch will be provided and Q & A will be at the end of the class.